The triple peaks of the Eildon Hills are the most distinctive single landmark in the Scottish Borders. At their feet in the valley of the Tweed lies Melrose. 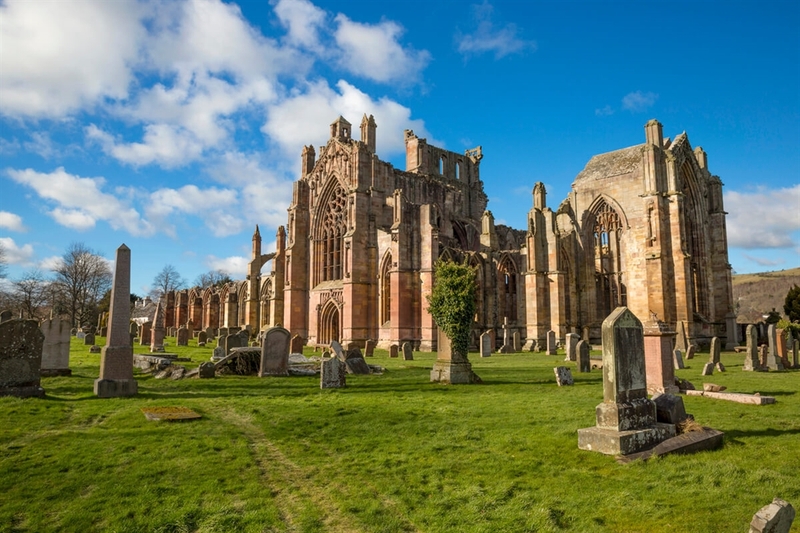 Ruined Melrose Abbey dates from 1136. A casket discovered believed to contain the heart of Robert the Bruce was marked by a re-burial ceremony and commemorative stone tablet. The area around Melrose has been inhabited for thousands of years. The Roman army arrived in AD79 or 80 and built a major fort nearby named Trimontium, 'Place of the Three Hills'. A signal station or shrine was built on the summit of the Eildon Hill North. The Three Hills Roman Heritage Centre houses the Trimontium Museum which is dedicated to Roman life in Scotland. Visitors of a green-fingered nature can visit one of the two National Trust for Scotland gardens in the area: Priorwood has an apple orchard which cultivates many historic varieties and Scotland’s only dedicated dried flower garden; Harmony Gardens is a beautiful walled garden with magnificent views over the abbey and Eildon Hills. Around 3 miles west of on the banks of the Tweed is Sir Walter Scott's romantic mansion of Abbotsford. 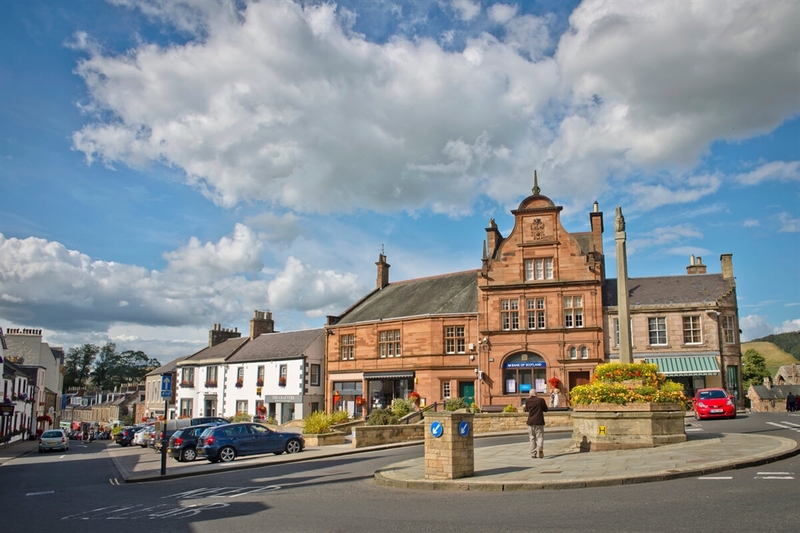 The town is also the home or rugby sevens and takes on a carnival atmosphere when the Melrose Sevens takes place in spring. The first tournament took place in 1883 and the event is now an action-packed international tournament, which regularly attracts teams from places such as New Zealand, South Africa, England, France and Portugal. VisitScotland / Kenny Lam, all rights reserved The red sandstone ruins of the imposing Melrose Abbey, stands in a grassy graveyard under bright blue skies VisitScotland / Kenny Lam, all rights reserved The red sandstone ruins of the imposing Melrose Abbey, stands in a grassy graveyard under bright blue skies VisitScotland / Kenny Lam, all rights reserved. Flower-bedecked roundabout at the heart of Melrose. Red sandstone buildings and whitewashed cottages line the main street. 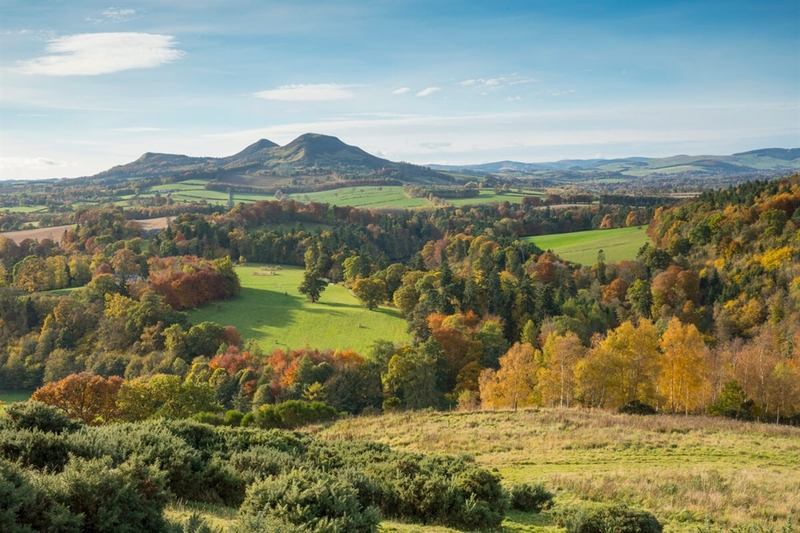 VisitScotland / Kenny Lam, all rights reserved Scott's view in Autumn, looking down over rolling hills, green fields and deciduous forests, near Melrose.